4 Week class begins Saturday, January 27th. Warm-Up, 30 minutes: During this time, players will complete a dynamic warm up that includes active stretching, J-Bands, wrist weights, the Oates Shoulder Tube, and PlyoBalls that will prepare each player to pitch while developing strength and improved arm action. Bullpen #1, 15 minutes: Players will utilize the Motus Sleeve and our wall mounted radar system during this session. 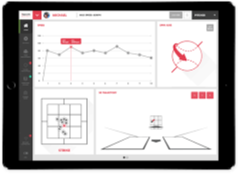 With a coach, players will be provided live pitching data including velocity, pitch count, elbow stress, arm slot, and degree of shoulder rotation. Players will focus on maximizing fastball velocity and command of the strike zone. Bullpen #2, 15 minutes: Players will work with the Raposdo pitching unit which will provide live data and feedback on each pitch. Data points include spin rate, spin axis, velocity, pitch break (both horizontal and vertical), and a strike zone analysis. With a coach, players will focus on developing their off-speed pitches during this session. Recovery and Strength Training, 45 minutes: After each pitching session, players will complete an arm recovery program and a specialized strength workout designed for pitchers. The arm recovery program strength workout is developed by Driveline Baseball. This program is offered to players ages 15 and up. The class will last 4 weeks. Classes will be held on Saturdays (Tuesdays are full). Pitch counts will vary based on each pitcher's needs, however no pitcher will throw more than 60 pitches in a session. Cost: The cost for this program is $249 . "The most important tool we have in house is the Rapsodo. It provides instant feedback on the pitch’s velocity, spin rate, spin axis, and pitch break. This gives insight into what the pitch is actually doing, and by comparing to other MLB pitches, how it can be improved. "-Driveline Baseball. We have worked hard over the past year to develop a training program that includes the best aspects of a private lesson with the best aspect of small group training. We strongly feel this program accomplishes this by providing players with individualized instruction (only two players pitching at once), live data and feedback, a structured warm up and recovery routine, and a customized strength program.